If you teach a child good oral hygiene habits early on, odds are that they will have better oral hygiene habits when they are teens and adults. As soon as a toddler gets their first tooth, it’s essential to start brushing and flossing their teeth. Afterwards, you will need to teach them the basics of good oral hygiene practices, especially when it comes to wearing braces. Find out what those basics are and what you should be thinking about for your child’s oral health! Good oral hygiene habits are essential for a healthy mouth and especially during orthodontic care. Many children need early orthodontics, which is also known as “child orthodontics”. This is when bite and alignment issues are corrected around age 7 or 8 to avoid serious problems later on. However, we hope that every child has good oral hygiene habits established well before this visit. Otherwise, not only will a child be dealing with bite and alignment issues, but they will also be dealing with tooth decay. As soon as your child gets their first tooth as a baby, you need to start brushing that tooth. Brush it morning and night with a rice-size amount of fluoride toothpaste. Also make sure to clean your baby’s gums with a wet cloth after feedings. Once they start to grow, begin teaching them how to brush their teeth properly. You will have to help brush your child’s teeth for the first couple of years until they have the dexterity in their hands to do it themselves. Flossing will come later as more teeth come in. Brushing the teeth is one of the most important habits a child can have. Brushing long enough is key for a healthy mouth. Make sure you get a toothbrush that fits the size of your child’s mouth. There are brushes for infants, toddlers, children, teens and adults. All will be different sizes and some children brushes will come in fun shapes and colors to help children brush. 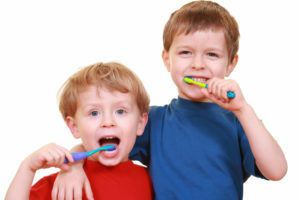 Children can’t always tell how long they have been brushing. Having them brush their teeth for a duration of a song or brushing your teeth alongside them to make sure they brush long enough. When they are old enough to have braces, brushing is even more important than before to avoid tooth decay. Food that gets stuck in brackets can cause rapid decay. Make sure they brush longer and at different angles to dislodge food. When children are first learning, brush with them as many days as it takes when first learning to brush their teeth. Do the same when they learn to brush with braces. Children won’t have to floss until they are toddlers. The baby teeth are spaced out until they all come in. Kids will have a total of 20 baby teeth that will start to come closer together as a baby ages. Until a child has the dexterity to use floss like an adult, it’s smart to invest in flossers. These are secure, hand-held flossing tools that children can put in between their teeth to easily dislodge food. Ask us about mouthwash and fluoride products to see if they should be part of your child’s oral hygiene routine as well. Starting from an early age, children need to start visiting the dentist. By age 7, they should see us for an orthodontic exam as well. Dental visits themselves are so important that most dental insurances cover those twice-a-year visits. These biannual visits generally consist of comprehensive exams and dental cleanings. At first, children may be nervous about visiting a dentist. Offices can be large with busy equipment that children aren’t familiar with. Dental tools can also be loud, which can make children nervous. However, these visits are nothing to worry about whether it is a dentist or orthodontist. To help your child get used to being in an office, make sure you go to a pediatric dentist instead of a general dentist while they are young. Pediatric offices (such as our orthodontic one) has staff that is trained to work well with children. Dr. Hardyl has experience with children on a daily basis. He was trained in both dentistry and orthodontics and can spot the signs of dental issues early-on. His staff knows what kids worry about and they know how to explain dental and orthodontic terms so a child can understand. An exam sounds serious, but it’s really just Dr. Hardy looking inside your child’s mouth for any bite, alignment or dental problems. If a child hasn’t seen Dr. Hardy by age 7, make sure to get them in for an examination! Start children out young when teaching them good oral hygiene. If you make a habit of brushing and flossing, children will see that example and will follow it. When you help them learn good oral hygiene habits as soon as they can talk and understand, they can start keeping their mouth clean themselves. There are many resources online to help teach children specifics of brushing, flossing, and for learning about dental hygiene. We help children every day with brushing, flossing, caring for braces and establishing good oral hygiene. Call Belmar Orthodontics at (303) 225-9016 with any and all questions you have about your child’s oral health. Let us help you as you and your child learn to establish good oral hygiene habits together!